SE Healthcare Data Analytics and Solutions > T. KARL BYRNE, M.D. Dr. T. Karl Byrne brings valuable clinical experience in the bariatric field. He provides clinical expertise in bariatric surgery matters for hospital, physician, and surgical clients. He also provides medical reviews of clinical care and support for the surgical risk management activities. As a member of the SE Healthcare team, he assists with the development of evidence based assessment tools and identification of key quality metrics to ultimately impact the quality and safety of care provided to patients by SE clients. 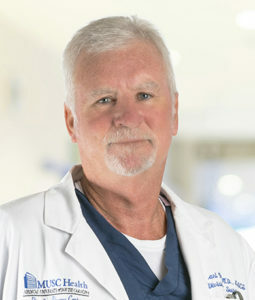 Dr. Byrne joined the faculty at the Medical University of South Carolina (MUSC) in Trauma and Critical Care Medicine after completing his residency. He served in that role while building his surgical practice, which included weight loss surgery procedures. His bariatric practice grew exponentially over the course of many years and is now focused solely on general and bariatric surgery. He has performed over 3,000 bariatric procedures, 1,000 gastric bypass procedures, and introduced the laparoscopic approach to gastric bypass weight loss surgery procedures. He is currently the Medical Director of the Weight Loss Surgery Program at MUSC. The Weight Loss Surgery Program at MUSC is designated as a Center of Excellence by the American Society for Bariatric Surgery. Dr. Byrne is board-certified by the American Board of Surgery and is also a fellow of The Royal College of Surgeons in Ireland. He is a member of the American Society for Metabolic and Bariatric Surgery (ASMBS) where he has been on many committees and has directed the Masters Course at past annual meetings. He is also a member of the American College of Surgeons and the Society of American Gastrointestinal Endoscopic Surgeons, as well as a number of regional and local associations. Dr. Byrne enjoys lecturing on the subject of bariatric surgery and has won several honors and award. A native of Ireland, Dr. Byrne obtained his medical degree at The Royal College of Surgeons in Dublin. After initial training in surgery in Ireland and England, he came to The Medical College of Virginia as a research fellow where he completed his surgical residency.